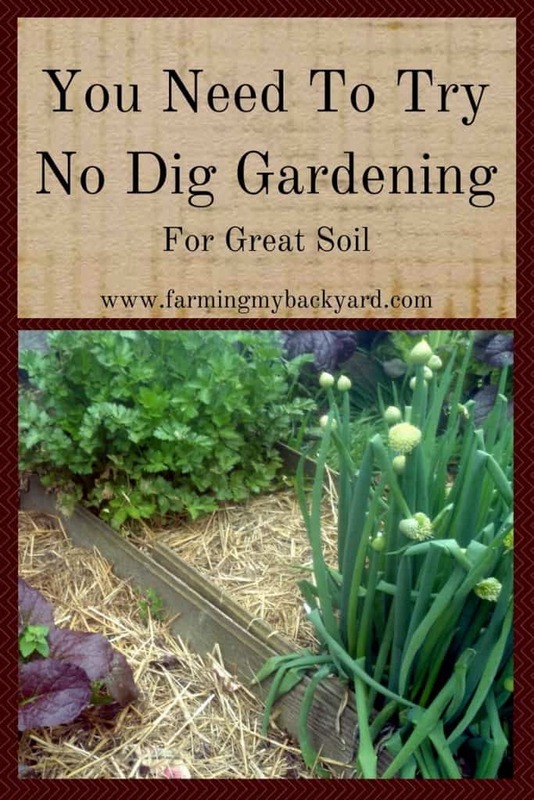 No dig gardening is a great way to cut down on weeds, watering, and enrich your soil and it even takes less effort than conventional double digging or tilling. Laying down a thick mulch suppresses weeds and holds in moisture. The materials also break down in place, feeding the plants for you. You can start a no dig garden at any time of the year. However, if you want a good head start, lay down a thick mulch in the fall and let it break down all winter before planting in the spring. When I started gardening I was single digging and adding in compost. Unfortunately, I’m terrible about weeding and it looked rather messy. I was inspired to try no dig gardening after doing more reading and research on permaculture. 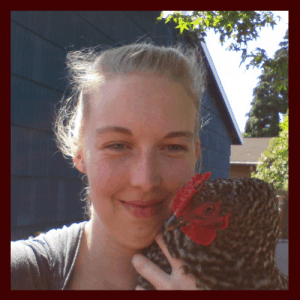 If permaculture is a new idea to you, I recommend checking out Permaculture For The Rest of Us by Jenni Blackmore, and you can read more about the book at the post 11 Reasons Why You Need To Know About Permaculture. I was scared of mulching because I was afraid I would smother my plants and create a slug dream world. But when I first mulched neither of those things happened. The plants are happy, the weeds are gone, and I’m going to keep doing this. It’s been several years and so far, so good. I love mulch! If you are building a bed from scratch, start is by laying down cardboard or newspaper to kill any growth underneath like weeds or grass. Then top the newspaper layer with compost, vegetable scraps, partially composted goat or chicken manure. On the very top add fresh straw and then soak it all with water to jump start it breaking down and to keep it from blowing away. There are range of good mulch materials such as leaves, straw, and wood chips, but I have lots of straw on hand, so that’s what I used. I’ve also called tree trimming services in our area and had them drop off mulch for free, and there’s even a website called Chip Drop that helps coordinate tree trimmers and gardeners for free mulch. If you have an existing garden, mulch around the existing plants. When it’s time to plant out transplants you can either add a scoop of compost around the plant before setting it into the straw, or dig down past the cardboard and plant it deep within the bed, depending on how large the plant is and how deep it needs to be planted. There are two different methods to planting seeds straight into the no dig garden. The first is waiting to mulch until seedlings are established. This is good first thing in the spring in an established garden where the layers have had a chance to break down and you are letting the soil warm up. The second method is good for new gardens. You add a layer of compost onto the mulch and then plant the seeds into that. What gardening method do you use? Do you dig or not? Have you used mulches? How did they work for you? Please share in the comments! If want to read more about building your soil read Building Soil Is The Big Secret To Great Gardens or Hugelkultur: Colossal Garden Beds For Remarkable Results. It looks very nice and I like anything that save me time (pulling weeds)! Thanks! I’m terrible at weeding so this has been working really well so far. This will be my first summer with a truly, heavily mulched garden. Your update makes me hopeful that this is going to work! Thanks! Nice! Thanks for sharing your method. I’ll be putting in a new garden this spring so really appreciated these ideas. The link to Chip Drop is awesome! Awesome, glad you can use it!